One of the earliest posts on the Natural Living Ideas blog revealed the wonderful benefits of Matcha green tea. It’s also been one of the most read posts and since publishing it, the popularity of Matcha green tea has risen immensely. This long standing tradition of Japanese culture is gaining worldwide acclaim and so we thought we should share with you the best Matcha green tea recipes from around the web so you can try it for yourself! NOTE: Want to try Matcha Green Tea for yourself? If you don’t already own some then the best brand you can buy is this DoMatcha Matcha Green Tea Powder from this page on Amazon. How To Make Traditional Matcha Green Tea – This video shows the traditional method of preparing Matcha Green Tea. It’s simple, healthy and delicious! Instant Matcha Energy Drink – This instant energy drink will provide you with a boost of energy minus the jittery shakes…a naturally caffeinated drink that will also boost your metabolism too! Matcha & Avocado Popsicles – Packed full of anti-oxidents these popsicles are a perfect treat, especially when you dip them in white chocolate for that added indulgence just like Kirra did over at Thedesignfiles.net. Matcha Coconut Cake – This tea time treat would make a perfect afternoon pick me up. Not only does it have the magic of Matcha in it, it’s also gluten free! Matcha Green Tea Muffins – Naturally sweetened with honey and made with whole grains, these muffins are a both good for you and delicious – this recipe is a must try! Matcha Coconut Fat Bombs – These little fatty bombs may not sound like the most tasty mouthful, but believe us, the creamy goodness paired with the slight bitter taste from the tea makes them incredibly moreish and brilliant for your health! Matcha White Chocolate Pistachio Cups – These little cups of happiness provide an awesome amount of anti-oxidants as well as an incredible taste all in a little treat. Beautiful to look at as well as fun to make! Green Tea Coconut Ice-cream – An ice-cream which is vegan friendly and healthy but totally mouthwateringly tasty – this recipe is great when you have a need for some creamy refreshing ice-cream! Healthy Matcha Green Tea Milkshake – This incredible milkshake is low carb, low fat, sugar free and high in protein, what more do you want in a refreshing milkshake? Green Tea White Chocolate Brownies – These green looking brownies are super easy to make and will taste fantastic too! With all the goodness of the Match green tea, a little bit of white chocolate sweetens the brownies to make this the ultimate treat! Coconut Matcha Popsicles – These popsicles will cool you down on the hottest of days, or can be enjoyed as a sweet treat after dinner. With only a handful of natural ingredients, these popsicles offer flavor, goodness and fun whilst being gluten free, dairy free and vegan friendly! Matcha Green Tea Fudge Protein Bars – Jessica over at Dessertswithbenefits.com has certainly found a winner of a recipe here, these gooey fudgy bars are full of ‘quality protein, healthy fats and all natural goodness’! What’s not to love? Matcha Tea, Pomegranate, Blueberry Slushy – This drink is packed full with so many anti-oxidants, it’s unbelievable! Not only it is one of the healthiest drinks out there, the fact that it’s a slushy makes it so much fun! Matcha Green Tea Pound Cake Recipe – Why not swap your chocolate cake for Matcha Green Tea cake this week, with simple instructions and only a handful of ingredients, this pound cake will certainly add to your baking repertoire. Matcha Chia Pudding – This two in one breakfast bowl offers you all you need in the morning! Caffeine from the Matcha to start your day on a high as well as loads of omega-3 from the Chia to keep you going all day! Matcha Truffles – These little mouthfuls of fun are healthy and so easy to make. With a preparation time of only 20 minutes, you can have these made and eaten within half an hour! Green Tea Swirl Cookies Recipe – Having a batch of freshly baked cookies is a home-owners dream, but what if these cookies were healthy and wholesome, but also super tasty? Well we think it’s a no-brainer! Check out this recipe over at Blommi.com. Green Tea Chocolate – In Japan, they call these chocolates ‘Matcha Nama Chocolates’ which means ‘melt in your mouth’. A name like that doesn’t need much explaining. Full of creamy goodness, these chocolates are a must! 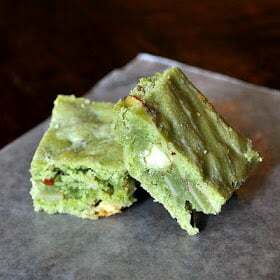 Baked Matcha Cheesecake Bars – This is a slightly more decadent way to enjoy Matcha Green Tea. A rich, creamy cheesecake filled with the nutritious powder! These will certainly impress your loved ones! Matcha Coconut Latte – This green drink is refreshingly simple, tasty and a great way to enjoy Matcha Green Tea! The coconut milk creates a wonderfully creamy drink which will have you wanting more! Want a tub of Matcha green tea powder in your life? Pick up a tub of DoMatcha Green Tea from here on Amazon.